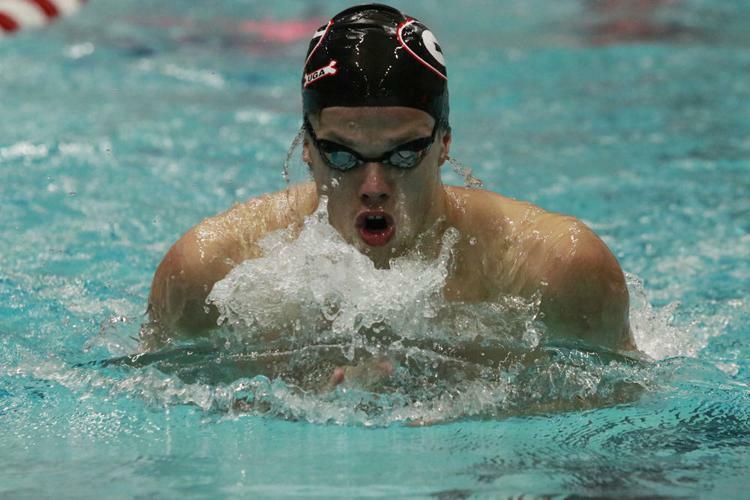 Georgia swimming and diving hosted its second home meet of the season against South Carolina Saturday. The Bulldogs prevailed, with the men winning 178-111 and the women winning 171-124. This is the first-time Georgia has competed against South Carolina in a dual meet since the 2014 season, when they also defeated the Gamecocks. Both Bulldog teams are coming off a loss in their last home matchup against the Florida Gators. Bulldog Javier Acevedo was out again this meet and cheered on his team from the side of the pool. Strong performances from James Guest, Greg Reed and Andrew Abruzzo allowed the Georgia men to propel past the Gamecocks despite the absence of Acevedo. Georgia standout Courtney Harnish swam both a long and short distance event nearly back-to-back with only one race in between the two. Harnish took first place in both, ending her 1000-yard freestyle race with a time of 9:50.06 and the 200-yard freestyle at 1:46.96. She finished the meet with a first-place victory in the 500-yard freestyle. She hit the wall with a time of 4:46.70. These are back to back meets for a Harnish sweep, winning all three of her events. The Bulldog underclassmen performed well and accounted for many Georgia first place finishes. The energy in the crowd was high early in the meet at Gabrielsen Natatorium as the Bulldog men swept the fourth event. This was the long distance 1000-yard freestyle race. In this race, sophomore Reed beat his personal best, finishing with a time of 9:00.22. This marks the eighth-best time in the event in Georgia history. He was followed to the wall by freshman Andrew Abruzzo and Kevin Miller. For the women, all eyes were on Bulldog freshmen Dakota Luther and Olivia Carter. Both registered the top times in the 100-yard and 200-yard butterfly in two straight competitions. Last week against Florida, Luther and Carter produced the best 200-yard butterfly performances in the SEC this season. This puts them at the third and fourth best times in the nation, both B-cuts. Against the Gamecocks, Carter and Luther continued to dominate in the 200-yard butterfly taking first and second places, respectively. Carter touched the wall with a time of 1:56.38 and Luther clipped a time of 1:57.61. The Bulldogs swept the event with Caitlin Casazza in third. The Bulldogs do not compete again until the end of November, when they host the Georgia Fall Invitational.